I have DJ Hero at home, and although I’m really not very good at it, I do love playing it. In fact, I miss so many beats, crossfades and scratches, I end up with some very minimal mixes. I guess at heart I’m just a drum and bass man. 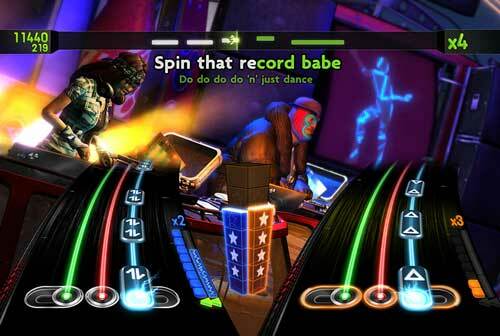 The next version of the game, DJ Hero 2, is out on October 20, and the playlist has been released. All up there are 105 songs, their vintage ranging from the 60s to present day, genres including rap, hip hop, Motown, disco, and even a remix of a Yeah Yeah Yeahs track. See below for the full playlist. The second version of DJ Hero sees not only a new playlist, but some new game features. DJ and vocal multiplayer modes, DJ Battles, and, with a microphone added into the hardware options, you can now also sing or rap along with the songs. The DJ Hero game is available in PlayStation 3, Xbox 360 and Wii formats. Having multi-player mode on board, it means that there are a few configurations of DJ Hero available. There’s no Australian pricing available yet, so the prices below as the US pre-order prices. Activision will publish its Australian prices closer to the launch date.